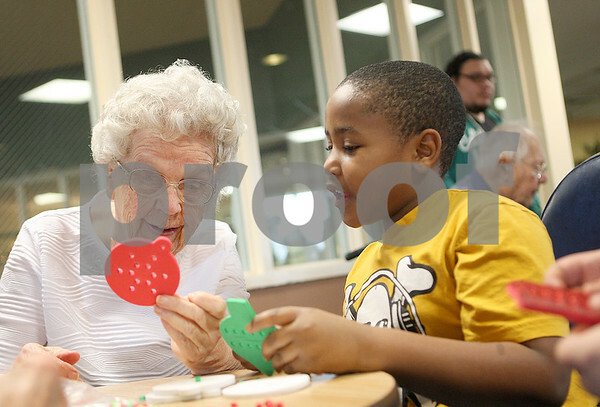 Jane Bastian (left), a resident at Oak Crest in DeKalb, gets help with her ornament from third-grader Ezell Dunning, 8, from Littlejohn Elementary School in DeKalb at Oak Crest during the Littlejohn Day of Caring on Thursday, December 18, 2014. About 40 third graders from the school made ornamnets with Oak Crest residents. All of the students at Littlejohn Elementary School participated in the Day of Caring event and each grade level helped the community in a different way.